Wolfgang Schmelcher may have been born near Stuttgart in the Black Forest of Germany, but since 1988 when he left Europe to begin what he calls his "gypsy life," his culinary career has taken him all over Asia. With culinary stints in Beijing, China, Jakarta, Indonesia, and Seoul, Korea, he has an excellent knowledge of Asian cuisine. Combined with experience in Sidney, Australia, Istanbul, Turkey, and Canada, he also brings an international perspective to his position as Executive Chef supervising the seven restaurants (Dragon Palace Restaurant, Kranzler's Restaurant & Bar, Honzen Restaurant, Rendezvous Bar & Lounge, Kempi Deli, Paulaner Brauhaus, Trattoria La Gondola, Sorobol) at the Kempinski Hotel Beijing Lufthansa Center. He was always interested in Asian even when he was in Germany. "Anyone who is a passionate chef is always interested in expanding their style. For a chef, Asia is Heaven, and is a must for every chef. Chinese techniques are the most amazing in the world." As for the culinary scene in Beijing, it is changing daily and becoming even more interesting. 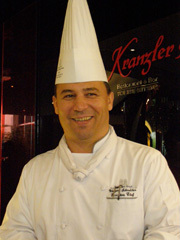 Chef Wolfgang changes the menus every 3-4 months, and of all of the hotel's restaurants, his favorite kitchen to play in is the open kitchen in the new Kranzler's Restaurant & Bar. He spends his free time with wife and two young daughters, enjoys lots of sports, tennis, squash, skiing, and scuba diving, and he used to skydive, but said that his wife curtailed that activity when they had children. Now he enjoys riding his 750cc motorcycle that is a replica of a 1938 BMW with a sidecar that he says is a huge amount of fun. His little daughter, Selena, age 2½ often accompanies him sitting in the sidecar wearing her helmet and goggles. Preheat the oven to 100oC (210oF). Method: Cut the lobsters in half, then along their joints. Toss in a little flour and pepper. Heat the olive oil in a frying pan, add the lobster pieces, and toss until the flesh just turns white. Place in the preheated oven for a few minutes until the shells turn red, and then add the tarragon, chives, and garlic. Cook the carrots in the stock until soft. Season with salt and pepper to taste, and puree. The mixture should not be too thick - thin out with a little stock if necessary. Check the seasoning again. Put the lobster heads in the oven and heat until the shells turn red. Place some of the lobster on each serving plate, and spoon the carrot puree over the lobster. Garnish with chives, leeks, and the warmed lobster heads. Wine suggestions: Complex chardonnay: 1998 Cullens Chardonnay; 1998 Robert Mondavi Reserve Chardonnay: 1997 Lafon Meursault "Clos de la Barre." Make the dipping sauce a few days ahead to allow the flavors to meld - it improves with keeping. I use older duck for this recipe because it has more flavor. Pan-fry the duck skin side down, in ½ tablespoon of grapeseed oil until the skin is crispy and brown. Depending on the size of the duck, you might have to finish the cooking in the oven. The duck should be just cooked. Combine the soy sauce, mirin, and brown sugar. Paint this glaze on the duck once it has come out of the oven, and slide under the broiler, skin side up, to brown lightly. Take the duck out from under the broiler, glaze, and broil again. Repeat one more time, taking care to remove the duck before burning. Let the duck rest for 7-8 minutes, covered with foil. Dipping Sauce Method: Combine all the ingredients and mix well. Pan-fry the leeks in another ½ tablespoon of the grapeseed oil. Presentation: Slice the duck breast and place on a plate with the leeks. Place the dipping sauce in a bowl. Sprinkle some black sesame seeds on the surface of the sauce. Wine suggestions: Medium to full-bodied pinot noir: 1998 Barrat Pinot Noir; 1997 Sanford Pinot Noir; 1997 Michel Gros Vosne-Romanee "Clos des Reas." Read the other articles on the Kempinski Hotel Beijing Lufthansa Center in the Hotels and Resorts, and Restaurants, sections.